- The sagittal (median) plane is a vertical anteroposterior plane, which divides the body into right and left halves. The slices paralleling this plane are called paramediansagittal or parasagittal planes. - The frontal (or coronal) plane is situated at a right angle to the sagittal plane and divides the body into anterior and posterior halves. 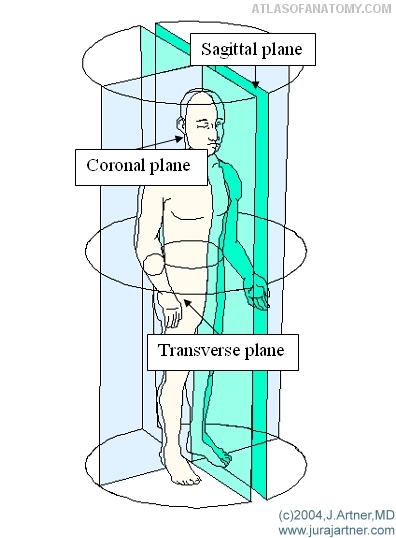 - The transverse (or horizontal) plane, perpendicular to the sagittal and coronal plane, divides the body into superior and inferior halves. In case of an organ or other body structure, the horizontal plane is at a right angle to the long axis of that structure (cross section). It is also possible to make oblique planes (for example MR- tomography special cuts), which lie at any other angles.